For those wanting to explore the heights of Dominica. 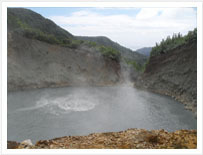 Dominica is the home of the second largest Boiling Lake and famous for it 365 rivers. The Boiling Lake, the World largest of its kind is approximately 10.5 Km due east of Roseau. The hike to the Boiling Lake starts in the Village of Laudat and is approximately a 5-7 hour round trip hike filled with adventure and excitement. 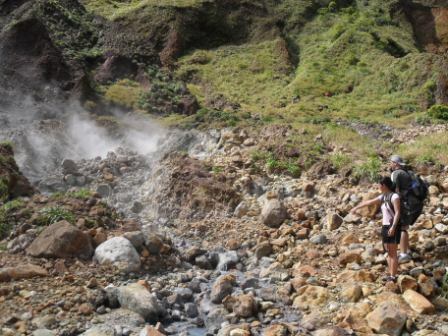 The trail to the Boiling Lake itself is about 12.87 Km, which begins at the Titou Gorge to a steadily climb into the mountains, after 1 hour of walking one should arrive at the breakfast river, where the trail to the Boiling Lake climbs the hills of Morne Nichols. The climb to the 3,216 feet Morne Nichols is the first challenge which consist of steep hills and narrow paths. On top of the Mountain, one may see a panoramic of both the village of Laudat and the City of Roseau along with the Caribbean Sea to the west of the Island and the Atlantic Ocean to the west. On a bright day one may see the island of Martinique to the south. Before leaving the top of the Mountain one can also see the steam rising from the Boiling Lake. Going down from the top of the mountain to the Valley of Desolation is not too much of a challenge, however climbing back up the mountain after the Boiling Lake on the way back is where the real challenge lies. But once you get back to the top, it’s going to be very easy hiking back to the end. From the valley of desolation, going to the Boiling Lake is not much of a challenge. Here at the valley of desolation you have a firsthand experience of the sulphur springs and volcanic activity.Five minutes from the valley is our very own natural Boiling Lake hot-tub, which is about 30 degrees Celsius. 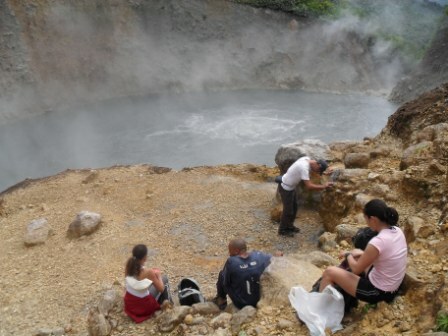 Be sure to Follow the instructions on your guide on the Boiling Lake hike at all times.